Whether you’re going on a short, long or an off-trail hike, your footwear will be the most critical gear regardless of the season. With the right pair, you can glide down a steep mountain with a smile. However, poor-quality hiking shoes can have you gnashing your teeth with each and every step in the wild. Do you agree that a poor footwear can make or break your hiking trip? In this case, you might want to invest in good quality Gore-tex hiking shoes. Gore-tex is a material that repels liquid which is a great boon for just about any hiking trips. On top of that, the material also allows liquid vapor to wick out. 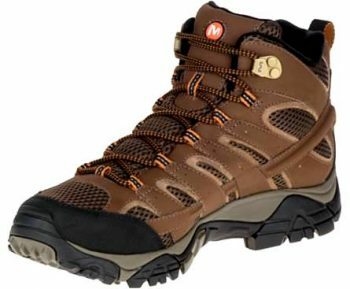 Also, Gore-tex is great for those who are looking for a lightweight but durable hiking shoes. However with all the number of options in the market, shopping for Gore-tex footwear can be rather daunting. Well, no need to fret because we are here to help. Will you be walking, running, day hiking, light backpacking, off-trail hiking or mountaineering? All these activities are different and most probably on different terrains. Moreover, the loads carried for each activity vary and so should the boot type. For example, a mid or low-cut boot with split-leather and multiple seams can work perfectly for a light pack and a well-kept trail. All is needed are Gore-Tex socks or a water repellent coat to boost their waterproof properties. However, you can’t rely on such shoes when the only hiking trail available is a goat beaten path through the alder tangles. In that case, boots with a full-grain leather, more rigid sole and above-ankle support will do. Nothing makes a dull hike worse than blisters, sprained arches, blackened toenails, plantar fasciitis and bone spurs than an ill-fitting pair of shoes. To avoid this, you should purchase a hiking shoe that fits properly. Fitting should start with your socks, as their varying thickness can alter the boot fit significantly. If possible, try on the hiking shoes while wearing similar socks to those you will use in the woods, or buy hiking socks and the shoes simultaneously. Also, consider purchasing a boot one/half size larger than the norm. Go for a boot that matches the volume and shape of your foot. Consider the shoe’s footbed as well, as it’s important that it protects the sole in order to prevent heel slip and arch pain. If you can’t try the boot before purchasing (like in a case of online shopping), have your feet length, arch length and width measured on a calibrated fitting device. Get details about your feet volume from specialists in order to ensure the most accurate fit. Send the resulting data alongside with the payments to the online store you will be purchasing from. You can also make use of sizing charts to help establish your size or consult boot fitters. This is a key consideration if you are hiking frequently. To have a durable boot, go for a shoe design that’s best suited for the terrain and your frequent usage. Also consider shoes made of full grain leather, polyurethane midsoles, and rubber with carbon additives outsoles to boost their hardness and durability. Most importantly, buy a pair with excellent customer reviews regarding their lifespan. The better the reviews, the better it is for your purchase. This takes into account many factors such as breathability, warmth and water resistance. For starters look at the padding. A tongue lining should be adequate and relatively stiff to combat discomfort due to tight laces and an internal ankle filler should be decent and adequate on each side to minimize chaffing. A Gore-Tex-made boot can also guarantee you warm feet as the membrane is windproof and thus alleviate chills alongside retaining your feet temperature. Better yet, select a pair with synthetic insulation for warmer feet. For added comfort, buy a pair that’s well cushioned to absorb shock and pressure alongside having well-positioned plates to protect your feet from roots and uneven rock bruises. Most importantly, break in your new shoes a couple of times before an extended hike for a better fit. You don’t want extra weight on your backpack, do you? This can result in a lot of ankle sprain and wasted energy just moving the boots around instead of getting where you need to go. Go for boots made of synthetics or EVA (ethylene vinyl acetate) midsoles as they are lighter. In this regard, Gore-tex shoes are a great option because they’re specifically made to be lightweight. Of course, not all Gore-tex footwear are created equal but you can expect that they’re lighter than your typical hiking pairs. Whatever your criteria, just ensure that your pair leans on the lighter side. A boot’s material has impacts on its breathability, weight, water resistance, and durability making it a very vital consideration. There’s a reason so many different materials are used, and that’s because they all serve a different function for different kinds of hikers. Full-grain leather: Great durability, as well as water- and abrasion-resistant. However, is not light and doesn’t have great breathability. Split-grain leather + nylon: Breathable, lighter than full-grain; has low water- and abrasion-resistance. Nubuck leather: similar to suede; durable, water-and abrasion-resistant, and flexible. However, it does take some time to break in before it’s comfortable. There are plenty of other materials you can choose from that meet your lifestyle, such as vegan materials, but it’s important that you way your choice against your comfort level and which activities you’re going to be engaged in on your hiking trip. You don’t want to be a victim of slipping and falling with each footfall, do you? To avoid this, go for stable hiking boots. Start with their midsoles: are they made of polyurethane or EVA? Consider buying a boot with a polyurethane midsole or one made from EVA densities as they’re firmer providing support and stability. When it comes to internal support, go for a pair with shanks covering the whole length of the midsole. Buy pairs with deeper, thicker and if possible spaced lugs for an improved grip alongside shedding mud more easily. In addition, consider heel breaks if you will be hiking in steep areas. Remember footwear aren’t just for covering your foot. They should provide protection, stability, support, proper cushioning and comfort to your feet by keeping off any adverse elements. Following the tips outlined above, you can be sure to select a perfect hiking boot that suits your needs. Whether you plan on going camping, hiking, mountaineering, snowboarding etc., there’s a Gore-Tex shoe out there for you. If you’re interested in some assistance, we hope that you will find our review of seven of the top hiking shoes helpful. But don’t feel pressured to purchase any of the shoes listed; use them as a starting point to finding a shoe that’s more suitable for your needs. Description: Much as the Vasque Men’s Breeze 2.0 Hiking Boots get steamy on hot and long hikes with their cuff feeling a little higher for light hikers, they’re the best option when tackling tough and demanding trails. For starters, the breeze is secure and comfortable. Its Gore-Tex liner ensures that the pair is breathable during cold seasons and resistant to elements keeping your feet warm and dry. 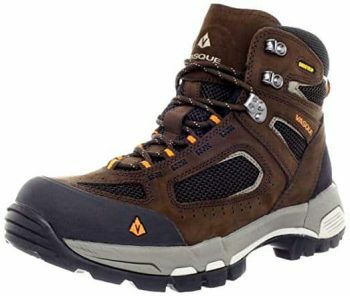 It’s a mid-cut boot with its cuff above the ankle for protection and control on steep hikes, loose rocks etc. The urethane plate provides midsole rigidity that’s highly needed in exhausting hikes. The heel box being narrow help prevents any slippage on steep rocks. In addition, its super aggressive outsole is made of rubber with toe bumpers for increased durability and protection. The Nubuck leather is top quality and has metal lacing hooks as an added bonus. Is it worth the dough? Absolutely as you can rely on this boot for anything any adventure throws at you. Related: Nothing is more aggravating than feeling your boots rubbing against your skin, but the MIRMARU Multi-Performance Crew Socks will take care of that problem for you. Available in a small range of colours, these socks are perfect for any activity, whether it’s hiking, running, or cross-country trekking. 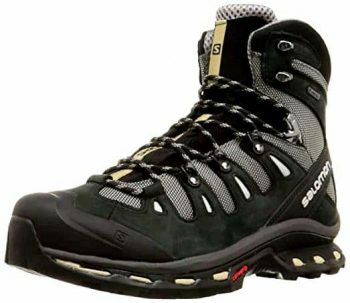 Description: Much as the boot may have some insoles problems and the need to double knot your laces, the Salomon Men’s Quest 4D II GTX Hiking Boots are the best for any hiker who loves their freedom. You can rely on it to keep on trudging regardless of the trail’s turn from a beaten baby powder to sleek mud. With adequate ankle support for comfort, these are built for the long and tough haul. They are fitted with features necessary to keep your feet jovial throughout the haul. Their Gore-Tex membrane is water resistant and breathable which ensure your feet are dry alongside preventing any chances of having soggy toes. Its Contagrip sole ensure firm traction as you navigate nasty scree fields and hairball ridgelines while their mud guard and padded tongue keep stubborn hitchhikers at bay. In addition, EVA midsoles supply long-lasting support and comfort with the urethane plate helping reduce ankle pain, control flex alongside enhancing stability. Related: It’s easy to get overheated while you’re hiking, but instead of wasting time changing into a different pair of pants, why not get the Columbia Convertible Pants? The legs are removable right above the knee, turning these pants into shorts so you can cool off a lot quicker while still looking stylish. Need to wade through some water but don’t want to feel weighed down on the other side? Remove the legs, and you’ll have no problems. Description: The Merrell Men’s Moab GTX Hiking Boot has a flaw in its design, which is that the hard rubber extends over the soft causing a ‘biting’ feeling. Worse, the soft rubber does compress with time and the stitches wear out fast. Nonetheless, this boot is ideal for anyone as its all round. Have you ever gone for a hike in Moab? That rugged and rocky terrain of the desert (Utah). If so, you can appreciate the need for support and breathability in your footwear. Much as it’s a desert, the downpours fall in epic proportions capable of creating flooded streams from dry creek beds in minutes. To avoid all these adverse elements, just lace up the Merrell hiking footwear and experience how supportive, lightweight, totally waterproof, breathable and grippy hiking boots should feel. What’s more is that these boots have Aegis antimicrobial pigment in their mesh lining that not only fends off the odor but also prevent bacterial growth in your shoe. Related: Sometimes you need to keep yourself safe while you’re hiking. Instead of running the risk of a bear attack, consider adding the Frontiersman Bear Spray to your arsenal to keep them away. Bears are known for sniffing out campsites with their great sense of smell, and have no qualms about breaking into your cooler to get at your tasty food. 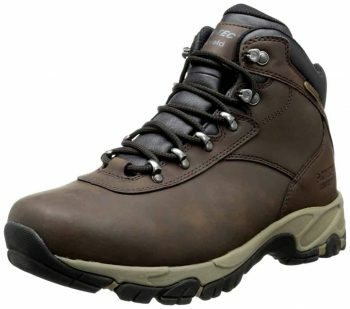 Description: Much as it’s not that breathable or a perfect fit for a narrow foot, the Hi-Tec Men’s Altitude V I Hiking Boot are the best companion for your feet. It’s sealed with Dri-Tec membranes to ensure full waterproofness, and with the exclusive I-shield coating, the shoe can repel water, oil, and dirt keeping them looking ageless year after year. You can worry less about these shoes getting tired, and focus your attentions on your hike and setting up your tent. Their Ortholite insoles deliver superior cushioning and lasting comfort while the molded EVA midsole absorb impact adding further comfort, cushioning and support. In addition, Multi-directional Traction rubber outsole provide a firm grip regardless of the terrain ensuring stability. What’s more? You get to have all these benefits with minimal break-in time. That means more time out in the field than wearing them around the home, trying to get them comfortable. Related: Although the point of camping is to get away from technology, nothing can boost your confidence more during a hike than listening to your favourite power ballad. The SoundPEATS Bluetooth Headset sits comfortably on the neck while the ear buds are in your ears, so there’s less chance of your cords getting snagged or tangled on a branch or jutting rock. 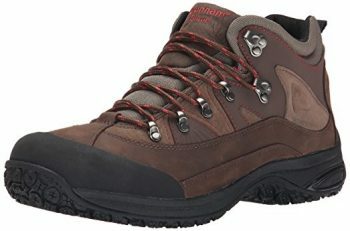 Description: Following customer reviews, the Dunham Men’s Cloud Mid-Cut Boot loses support and cushioning very fast. Its siding stitches loosen really fast too. Nonetheless, these Dunham boots provide waterproofing and comfort which ensures that your feet are dry and happy. They feature a graphite rollbar that is strategically positioned in the midsole for maximum rear foot stability. Less strain on your arch means longer walks without any pain. Its medial and lateral TPU posts ensure strides alignment for comfort regardless of the terrain. In addition, its TRU-TRAK sole provides aggressive traction while premium foam disperses shock and pressure adding support and stability. No hiking boot is better equipped to keep you going on those rough trails, no matter how long or rugged they are. Overall, the Cloud is a great pair that boasts great quality and good fit. It also doesn’t hurt that this is a fairly affordable boots as well. Related: Being out in nature means taking in all that it has to offer, and that means bringing a great pair of binoculars. The SkyGenius 10 x 50 Full-Size Binoculars comes with its own carrying case and lens caps to keep them protected when they’re not in use. It has a great 10 times magnification, provides a clear image, and is extremely durable, making it perfect for any camping or hiking trip. 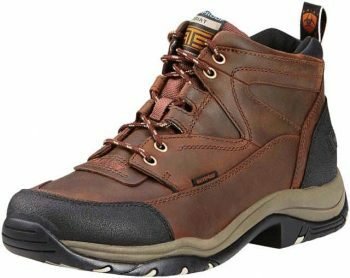 Description: The Ariat Men’s Terrain H2O Hiking Boot are made to have a strong finish over rugged terrain while providing great protection and performance following their oiled full-grain leather. This is guaranteed to keep your feet dry and protected from any bacteria or fungus that can occur from wet socks. You’re not only keeping your feet comfortable, you’re also keeping them healthy. Inside, the waterproof membrane together with moisture-licking lining keep your feet comfortable and dry. No more sweaty feet and no risk of Athlete’s Foot. Underneath your feet are shock- and pressure- absorbing EVA midsoles, along with ATS sole technology to provide you with ergonomic cushioning and support all day. That means you can save more of your energy for getting to the top of that peak with your gear on your back instead of dragging your aching feet around, wishing for the journey to end. All in all, this is a very solid that offers good protection and comfort. Related: Going camping means packing as much of your gear as possible without being overburdened, so forget the rollout mattress and consider the TNH Outdoors Inflatable Sleeping Pad instead. It comes with its own drawstring storage bag, and rolls up into a compact size to maximize on the space you need for the rest of your gear. 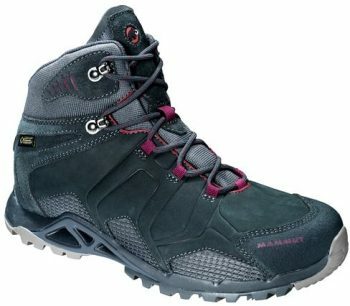 Description: Much as their outsole appear to be slightly warped, the Mammut Comfort Tour GTX Women’s Hiking Boot are the queen of any trail. Root-riddled, craggy trails are nothing to these hardworking boots, and you’ll definitely feel the difference. They’re build to handle slippery descents and tricky inclines. With their Gore-Tex Surround technology, they ensure your feet remain warm, dry and at optimal comfort alongside preventing blisters. Their Nubuck leather and shell fabric provide protection against jagged roots and rocks while their IP EVA wedge, grip comfort sole and sonar technology ensure comfort and ample traction throughout the hike. They promote the natural gait so that you’re not placing any unnecessary stress on your legs, hips or back, and that means less pain at the end of the day. So instead of trying to work your way through a hike with an uncomfortable pair of boots, consider adding these to your repertoire instead. Related: If you’re looking for hiking shoes that are a bit lighter and have a sleeker profile, then the Scarpa Mojito GTX may be just what you’re looking for. These women’s shoes are a slip-on hiking shoe with traction that’s proven to get you up those slopes in no time. They have a shock-absorbing EVA wedge that’s guaranteed to reduce the pressure on your feet with every step, and help you tackle those rugged hikes in style. With all the information we’ve provided to you, you’re well on your way to finding the best Gore-Tex hiking boots money can buy. Keep in mind the features that are most important to you, while balancing your budget so that you’re getting the most out of every dollar. There’s no reason to waste your cash on a boot that just isn’t going to work for you. Do you know of a Gore-Tex hiking shoe that we should have included in the list? If so, include it in the comments below.